The Sassy Pack Rat: A Very Tiny Sneak Peek. 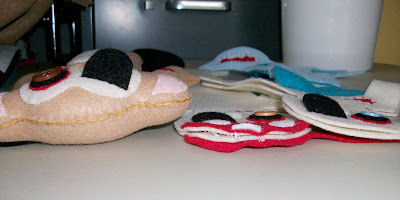 I've been steadily working on new plush designs specifically for STUFFED magazine. They are different from what you've seen me do before. I can't really show what I'm doing. It's partially a jinx thing and partially cause I want their debut to be in STUFFED. Of course if they aren't accepted (I might cry but I'll get over it) then I'd show them. I've given myself a deadline of next weekend to have them finished and ready to ship. One of my twitter friends, Joni has been asking to see something on these new plush so here's a sneak peek. Well I did say peek, didn't I? So far I have one almost done (he needs clothes) One 3/4ths done, one not even a 1/4 done and the last one is only a body with no details at all. So you can see I have a lot to do in a short amount of time. In case you are interested, the bodies are a pattern of my own making, obviously. The clothes and details of all my plush and dolls are freehand and I usually make them up as I go along which is time consuming. I change my mind a lot and usually end up with something completely different than I intended when I first started. Here's a small hint. I was working on my custom stationery business doing an invitation and favor stickers in a Princess and Pirate theme and had a "light bulb" moment for these plush. And that's all I'm saying. What are they? Barnacles! They're barnacles! I want to see! I just started to follow you, and I think your work is amazing. Come on over and visit me as I love vintage toys, too! Oh the suspense...it will be awesome! Can't wait!